Yesterday, it appeared that Elvis Dumervil's failed contract negotiation with the Broncos was thwarted by a fax machine, a piece of technology rendered obsolete some 11 or 12 years ago by the advent of .pdf documents and email. It seemed like Dumervil was just another victim of the NFL's hard-assed resistance to change, if in a new and particularly stupid way. Today, things are more complicated: Dumervil's deal with the Broncos may have been fouled-up over fax, but the Broncos are claiming they had good reason to think he had backed out, and no time to accomodate his change of heart. If they're telling the truth, Dumervil's career hinged on an hour of indecision, and it worked out about as badly as it could have. "Due to the procedural elements that were involved in executing the new proposal, we imposed a 1 p.m. MDT deadline for a decision, one hour before the NFL's waiver wire at 2 p.m. MDT. Our deadline was clearly communicated to Elvis' representative," Elway said in the statement. "At 1 p.m. MDT, we were informed by Elvis' representative that he declined our offer. We then prepared Elvis' termination notice to officially file his release with the NFL office. "At approximately 1:25 p.m. MDT, however, we were informed that Elvis changed his mind and accepted the same contract we proposed nearly two-and-a-half hours earlier. Although we expressed our concern regarding the time constraints, we were assured that the signed documents would be submitted to us before the league's waiver deadline. "We did not receive the documents from Elvis by the league's deadline and were forced to release him shortly before 2 p.m. MDT. Dumervil may have missed the NFL's deadline by a scant six minutes or so, but it was 25 minutes after the Broncos' internal deadline that he decided he would take the pay cut, and Dumervil's rep ultimately submitted his paper work 67 minutes after the Broncos requested it. Of course, this is John Elway speaking, and his side of the story doesn't align with Dumervil's agent, who says the Broncos sent back a revised contract at 1:45 p.m. MDT. Still, whichever version of the truth comes closer to reality, it's no less bizarre to think of NFL players making calls on 33% pay cuts in a matter of few hours than it is to imagine them faxing contracts too late. Think what went through Dumervil's head in the 25 minutes between telling the Broncos "no, thanks," and deciding he would come back at on a contract worth $4 million dollars less–and then the next 40 minutes or so, in which he scrambled to get his paperwork in and was informed that he was too late. Even when the season ends, NFL players' fortunes are still dictated by dramatic, hour-long blocks of time that often come down to tiny units of measurement—inches on the field, minutes off it. 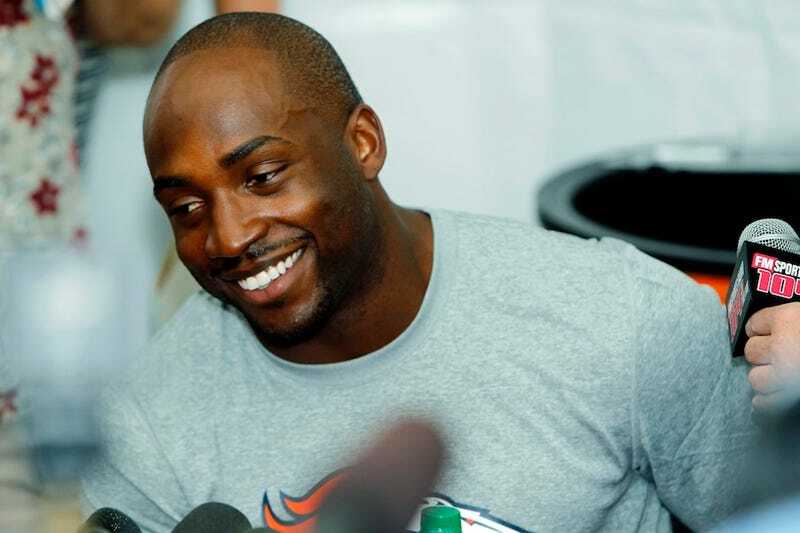 Fortunately, the NFLPA will investigate to make sure Denver treated Dumervil fairly.